This summer, as our fruit (blueberries, cherries, raspberries, apples) began to ripen, Aaron came home one weekend with a dehydrator. It’s round and shiny-white, shaped like a donut with a too-small center hole, and has four drying trays plus a fruit leather tray liner and a liner for jerky. So I’ve spent the summer’s end learning to dry fruit. My greatest success by far has been apples, both slices and leather. You can see my method for drying apples here. 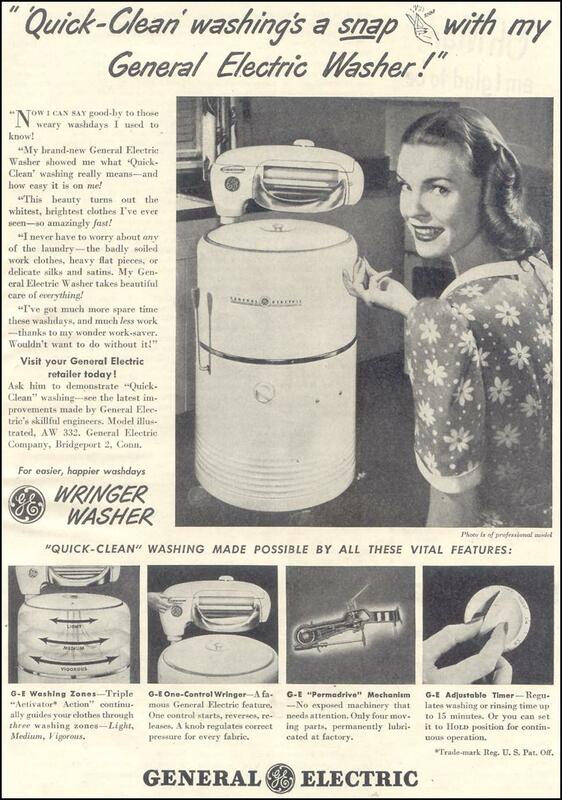 This is very close to what our machine looked like, except my mother never looked that excited to use it. Nor did she wear a white-collared dress while operating it. would start up the generator to run the ancient wringer washer – a big improvement from the manual James washer that sat out back behind a shed. Fuel had to be boated down the Stikine River in huge 50-gallon drums in our 20-foot skiff, so we didn’t use that generator any more than we absolutely had to. With no refrigeration or weekly shopping trips, we had only what fresh food we could forage or hunt from the forest, catch in the river, or grow in our garden. I know that sounds like the life of Hansel and Gretel, pre-stepmother, but it’s what we did. And we dried or canned as much as we could for winter, since we wouldn’t have access to any fresh food once hunting season was over. I liked the dried food best – it had less mush. Raspberries. High-bush cranberries (properly known as lingonberries). Saskatoons. Strawberries. Thimbleberries. And we occasionally had crab apples from a neighbor (which here means, anyone living within a 30-mile radius). Once we even had bananas. At some point, my dad built a drying shed. He dug a square pit, about 3 feet deep, and put a barrel stove in the bottom of it – that’s a stove made from a large metal barrel. They’re actually pretty effective. You can get kits for them, with a door and legs and hardware for a chimney. 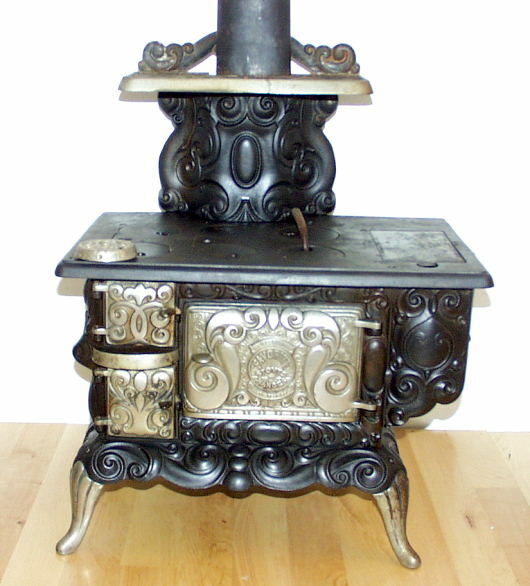 This stove was rustic looking, not like the nicer one he made for our cabin, which had heat-resistant black paint covering it and a big flat silver tray fitted onto the top for heating a giant pot of water for laundry and baths. The one in the drying shed had whatever flakes of paint still clung to the original barrel, interspersed with large areas of gently rusted steel. No one cared what this one looked like. He built walls around the pit once the stove was in, with a tightly-fitting door covering the whole front side. The walls had supports all around for sliding trays made of window screen material. We would put whatever we were drying – meat, vegetables, fruit – onto the screens, slide them in, and let them sit with the stove gently heating them until they were dry. Our stove was less ornate , white-enameled, and had an enclosed warming oven where this stove has a shelf. Otherwise, it looks pretty familiar. small enough at that point that I don’t remember much as far as culinary skills. She thinks she used the warming oven in our big cast-iron range (think Blueberries for Sal, and you should have a good picture of our stove). So I’m guessing all you readers with modern kitchens, but lacking a dehydrator or a niftily-built drying shed, could still use my method for drying apples – you would just need to turn your ovens on low. No, I’m no stranger to drying fruit. But my memories are nearly useless living, as I do, in a rural area less than half an hour from a major city. Drying fruit should be accompanied by the aroma of smoke in the air, the unique smell of cranberries (I know, I KNOW, lingonberries, sorry) ripening amid fallen leaves. Drying fruit comes with the creak of a wooden door, the rush of earth-metal-fruit-scented air in my face, the smooth glide of a screen pulling free from the rails. Using a dehydrator, after a drying shed or a cast-iron range, feels somehow artificial. Perhaps I feel I’m not working hard enough. In any case, the apples are delicious, and while I miss the nostalgic connection to my roots, I’m happy to have the ease of my shiny new dehydrator – all I need now is more trays for bigger batches! You can click here for a more modern approach to drying apples!